The Cuban parrot scientifically known as Amazona leucocephala is a lively medium sized bird. Despite being called the “Cuban Parrot” it is not actually endemic to Cuba. This parrot can also be found in Abaco, the Cayman Islands, Bahamas, and the Great Inagua (Neotropical). The Cuban parrot lives in a wide variety of habitats. 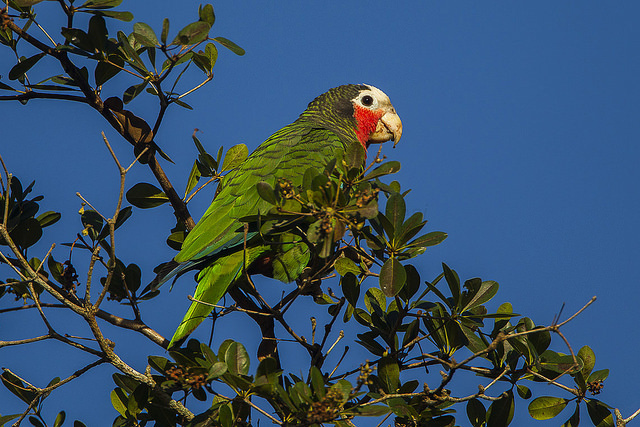 In Cuba, most of these parrots are found in the remote woodlands. Others can be spotted in the dense woods close to sea level (Bond). The Cuban parrot is a fairly small bird only weighing about 222-223 grams (Arkive). They have a height of 30 centimeters and a wingspan between 6.75-7.75 inches (Linné). The male birds tend to be one to four percent larger than the females (Reynolds). They are a colorful bird with a lot of color variations which is why they are often called the “rose throated parrot” (Neotropical). Most of their body is green, and they have a red throat, a white forehead and white eye-rings. Their outer flight feathers, also known as primaries are blue which makes the feathers look scaled and edgy. Some of the birds may also have a maroon abdomen and a yellow under tail (Bird Life) (Bond) (Arkive) (Animal Diversity). Breeding season for the Cuban Parrot occurs once a year throughout spring and summer. They usually lay between two to four eggs that are incubated for twenty-six to twenty-eight days. Cuban parrots are relatively sedentary and exhibit low levels of activity and no migration patterns during this time. They normally build their nests in hollow tree cavities in the woodlands (Animal). Cuban parrots weigh only 10 grams whenever they hatch from the egg. Fledging usually takes about 8 weeks (Amazon Parrot). It is during this time that the male bird stands guard of the nest and brings food for the chicks until they are old enough to get their own (Animal Diversity). The Cuban Parrot is a very outgoing bird. In the morning these birds can be very raucous and extremely noisy (Geary). It is said that the Cuban Parrot is like having a two-year-old child (Beauty). The sound these birds make is like a long “yaaart yaaart” type of squawk and a trumpet like squeak (Animal) (Parrots). 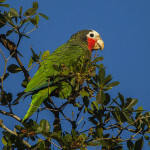 Cuban parrots are often found in pairs especially during breeding season (Rogers). However, they can also be seen in large groups especially where there is an abundance of food (Parrot Link). These parrots consume a wide variety of food within their diet. 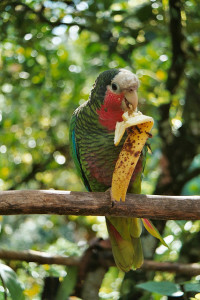 They eat many fruits such as mango, banana and papaya (Parrot Link). They also consume many seeds, nuts, berries, buds, and blossoms. Some birds even feed of off farm crops as well as the terminal branches of trees. The birds diet ultimately depends on its ecological habitat (Rogers) (Vaurie). As previously mentioned, Cuban parrots usually build their nests in trees in hollow tree cavities. They typicaally inhabit woodlands of pine and palm trees (Rogers). Parrots located on the island of Great Abaco in Bahamas nest in limestone holes on the forest floors. The Bahamian pine forests are fire-dependent with surface fire regime. An experiment was performed to see how the fire affected the temperature of the nests. The results showed that the temperature inside the nest only rose five degrees Celsius and showed that these ground nests are the safest place for these birds to live during a forest fire (O’Brien). 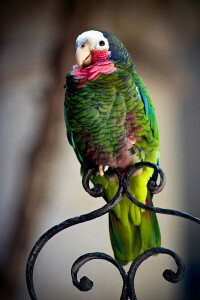 The Cuban parrots are compatible with other parrot species especially the Conures (Beauty). The Alexander von Humboldt National Park located in eastern Cuba has many endemic birds along with the Cuban Parrot (Wezel). They are also closely related to other bird species such as the Hispaniolan and Salle’s Amazon (Low). There are also four subspecies of the Cuban Parrot. They are very similar to one another but are slightly unique in their own way. For example, the A. l. caymanenis is slightly larger bird and found only in the Grand Canyon. A l. henesta has more yellow in its feathers, ia slightly smaller and is located around the Grand Canyon. The third subspecies is the A. l leucocephala is a slightly smaller bird with more yellow-green feathers and ranges from Little Cayman and Cayman Brac. The last subspecies is A. l. bahamensis is a larger bird with a more extensively rosy colored throat and is found in the Bahamas (Peters). The slight differences in these characteristics are a result of the variations in the birds’ ecological habitats and have developed because of the reproduction isolation of the subpopulations (Reynolds). Trichomonas is a parasite that affects the gastrointestinal tract of Cuban parrots. In 2009, a veterinary clinic of ANOC took a sample of twenty-five chicks and tested them by using an oral swab. Ten of those chicks (40%) tested positive forthe Trichomonas parasite. Scientist planned on investigating further into the parasite in order find out the sources of contamination and to help protect the bird species (Soto). The Cuban Amazon is a rare endangered species. Agricultural land conservation, trapping/selling and hurricane destruction are all contributing factors to their declining population. Laws banning international trade have been enacted to try to allow their populations to naturally grow (Arkive). In 1988 there was a population estimate of five thousand. Today, there are around ten thousand parrots (Beauty). On December 17 1995, a population survey took place in the northern part of the Isla de la Juventud. Many wildlife scientists came to observe the population of the Cuban Amazona and the Sandhill Cranes. Their results showed that out of the 1320 birds observed, 61.2% were parrots and 38.8% were Sandhill Cranes (Aguilera). Captive breeding programs have been established in many parts of Cuba in a hope to increase the parrot population. Scientists used a mitochondrial haplotypic and nuclear genotypic data to study the genetic variation within these programs. Studying the genetic variation helps scientist understand the population’s history as well as providing significant genetic data for the conservation centers in Cuba. Conservation centers are continuously performing experiments and studying the Cuban Parrot in order to learn more about them and to protect this beautiful species (Milian-Garcia). Amazona leucocephala. Animal Diversity Web. 2014. Web. 29 July 2015. Amazona leucocephala Cuban parrot. Animal Diversity Web. 2014. Web. 27 September 2015. Amazona leucocephala (Linné 1758). Arndt-verlag. n.d. Web. 29 September 2015. Amazona leucocephala. Neotropical Birds Online. 2010. Web. 27 September 2015. Amazon Parrots from South America.. Beauty of Birds. 2011. Web. 26 September 2015. Amazon Parrot. Parrots. 2015. Web. 29 September 2015. Cuban Amazon Amazona leucocephala. Bird Life. 2010. Web. 29 September 2015. Cuban Amazon. Arkive. 2013. Web. 29 September 2015. Cuban Amazon. Parrot Link. 2015. Web. 28 September 2015. Geary, John. Amazon Parrot Behavior Revealed. Bird Channel. 2015. Web. September 28 2015. Aguilera, Xiomara Galvez. “Population size of Cuban Parrots Amazona leucocephala and Sandrill Cranes Grus Canadensis and community involvement in their conservation in northern Isla de la Juventud, Cuba.” Bird Conservation International (1999): 97-112. GoogleScholar.Web. Low, Rosemary. “The Cuban Amazon.” The Parrot Society UK (1996): 26. GoogleScholar.Web. Milian-Garcia, Yoamel. 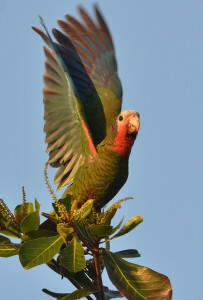 “Founded: Genetic Reconstruction of Lineage Diversity and Kinship Informs Ex situ Conservation of Cuban Amazon Parrots (Amazona leucocephala).” Oxford Journals (2015): 573-579. GoogleScholar.Web. O’Brien, JJ. “Effects of Prescribed Fire on Conditions Inside a Cuban Parrot (Amazona leucocephala) Surrogate Nesting Cavity On Great Abaco, Bahamas.” Wilson Journal of Ornithology (2006): 508-512. LionSearch.Web. Peters, James L. “The Races of Amazona Leucocephala (Linn. ).” The Auk (1928): 342-344. JSTOR.Web. Reynolds, Bryant J., Hayes, William K. “Conservation Taxonomy of the Cuban Parrot (Amazona Leucocephala); Variation in Morphology and Plumage.” J. Carib. Ornithol (2009): 1-18. GoogleScholar.Web. Rogers, Rachel W. “The Cuban Amazon Parrot.” University of Michigan School of Natural Resources (2000) LionSearch.Web. Vaurie, Charles. “Field notes on some Cuban birds.” The Wilson Bulletin (1957): 301-313. LionSearch.Web. Wezel, A and Bender, S. “Agricultural land use in the coastal area of the Alexander von Humboldt National Park, Cuba and its implication for conservation and sustainability.” Kluwer Academic Publishers (2002): 241-249. CabAbstracts.Web.